Do your bit for the environment and enjoy luxurious, noise-free mowing with a battery operated ride on mower. Hastings Mowers is a supplier of genuine Husqvarna electric ride on mowers. Why should you buy an electric riding lawn mower? Another of the benefits of electric and battery powered riding mowers is that they’re extremely quiet. They operate at around 80 db, compared to the 95 to 100 db emitted by petrol powered models. No more disturbing the neighbours when you decide to mow first thing on a Sunday morning. By far the biggest advantage of electric ride on mowers for sale is that they have zero pollution emissions and are, therefore, far better for the environment than the alternatives. Not only will you be protected from inhaling potentially harmful fumes, you’ll be doing your bit for the environment. As there is no combustion engine in electric riding mowers, you’ll find that there is very little maintenance required in order to keep the machine in tiptop condition. No fuel, oil or belt servicing is required. The compact design of electric and battery powered ride on mowers makes them so easy to manouevre and enables you to mow in smaller spaces. The compact size of the battery powered ride on also means less storage space is required. 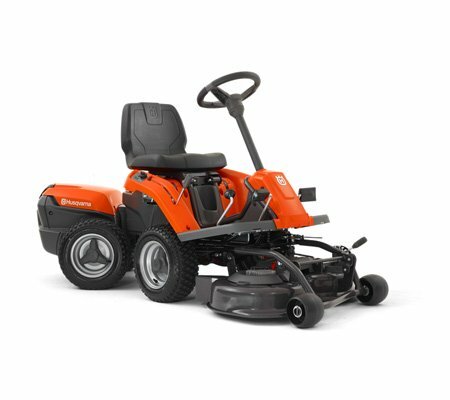 If you are looking for Husqvarna electric ride on mowers in Melbourne, you’ve come to the right place! Hastings Mowers is a keen supplier of the brand’s first battery operated ride on mower. The battery has approximately 90 minutes run time and is completely rechargeable for your convenience.